FIFA 16 is set to hit UK shelves on 25 September this year, and the details of the latest installment – as well as the potential cover star – have got everybody talking. The franchise’s most recent incarnation, FIFA 15, was the best-selling game in the UK in 2014, with nearly double the sales of GTA V. So, how can FIFA 16 take it to the next level? Much of the allure associated with the FIFA games is through various types of competition that the games provide. Picking up two controllers and going toe-to-toe, one-on-one with a friend seems antiquated compared to the multitude of options available today. Now, a player has the opportunity to enter cups, progress through divisions, or even create their own Ultimate Team. Creating an Ultimate Team can be achieved by adding funds to a Playstation Network account, and then making some big signings. Unfortunately, the latest version of FIFA still doesn’t offer a return on the investment made in creating a world-beating team, which in a way bucks the trend recently set by the rise of many eGaming sites. The huge popularity of online casino sites such as Ladylucks that offer a wide variety of games and some tempting bonuses, have meant that many games developers have been looking at ways in which they can incorporate elements of gambling in their gameplay. There have been many rumours of the highly successful Grand Theft Auto series making an inclusion of a casino feature, and it would make perfect sense for FIFA to include elements of sports betting. Thankfully, FIFA still has a few other new tricks to show us. 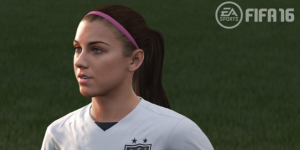 In addition to the various gameplay improvements that include fake tackling, no touch dribbling, and a special FIFA Trainer, it’s the inclusion of twelve women’s national teams that has made the headlines. To mark such historic progress, the Australian star Steph Catley will join world-renowned superstar, Lionel Messi on the Australian cover. EA also put together a Twitter poll to see who the fans wanted to star alongside Messi on the games UK cover. Interestingly, no Arsenal or Manchester United players were selected. Perhaps that’s a subtle acknowledgment of the Gooners recent poll hijacking or United’s popular standing in the game as unfair advantages? One can only speculate EA’s intricate thought processes. Liverpool’s Jordan Henderson, Manchester City’s Sergio Aguero, Chelsea’s Thibaut Courtois and Tottenham’s Harry Kane were all in the running to grace the famous case, but ultimately Liverpool’s newest skipper Henderson came out on top in the voting. Interestingly, Chelsea flop Juan Cuadrado won the Latin-America vote and the right to rub shoulders with one of the greatest of all-time stars on the cover in that region. Either way, FIFA 16 is sure to take things to the next level. Will it grow like Harry Kane’s stats from last year to this season? That’s a tough ask by anyone’s standards – but don’t bet against it. The Football XI or Football 11 is the most important number for any team. We aim to cover all aspects of Football/Soccer/Calcio ! All feedback apreciated! Are Arsenal and Liverpool genuine title contenders? Will There Be Any Shocks in the Latter Stages of the Champions League?